The 5th annual Lakeview Soup Walk, Sunday February 24, 2019, 12-3pm. 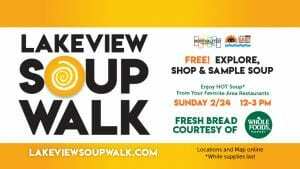 Join us for FREE restaurant soup tasting at your favorite Lakeview shops. Start at any of the 21 locations! The soup walk is FREE, great exercise and a delicious journey of discovery! Presented by the Northalsted Business Alliance & Lakeview East Chamber Of Commerce. Click below to browse 2018 photos.